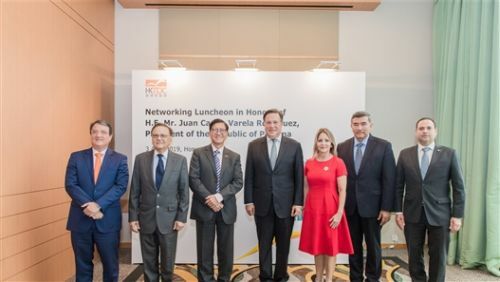 HONG KONG, Apr, 04 2019 - (ACN Newswire) - The Hong Kong Trade Development Council (HKTDC) organised a networking luncheon yesterday (3 April) in honour of Panama President Juan Carlos Varela Rodriguez, who was visiting with a high-level official delegation to promote trade and investment with Hong Kong. Hosted by HKTDC Acting Executive Director Raymond Yip, the luncheon was also attended by Panama officials and Hong Kong business leaders. At the event, both Mr Varela Rodriguez and Mr Yip highlighted the potential for further business collaboration between Panama and Hong Kong, including in areas related to the Belt and Road Initiative and Guangdong-Hong Kong-Macao Greater Bay Area Development. "Hong Kong is playing a pivotal role in these initiatives, serving as a centre for financing, investment, logistics, trading, infrastructure and real estate services, and a whole range of professional services including dispute resolution, risk management and more," said Mr Yip. "This makes the city an ideal partner for Panamanian enterprises looking to seize opportunities in this region." He added the HKTDC could connect Panamanian and Hong Kong companies for joint business success. "We at the HKTDC stand ready to lend our expertise and support." His remarks were echoed by the Panamanian president. "Our greatest interest with you is to continue to grow a strong relationship that allows our commercial, educational, cultural and tourist exchanges to increase," said Mr Varela Rodriguez. "Let us continue working hand in hand for global prosperity and for the mutual growth of our economies."